Richards, whose father Gordon won the race twice, in 1969 with Playlord and again in 1990 with Four Trix, has enjoyed a resurgent couple of seasons. When the favourite Vintage Clouds dropped away, it was Takingrisks and Eider Chase winner Crosspark fighting it out, with Quinlan’s mount going four lengths clear. A jubilant Richards, referencing his father, said: “He won it twice, and I’ve followed up so it’s great. “You need a good-ground horse who stays – and luck. He nearly came off him at the first. “He’s been a grand one, very consistent, and I think the improvement is down to the cheekpieces. The CPMS Scottish Champion Hurdle was turned into a procession by top-weight Verdana Blue. Nicky Henderson took the decision to hand 7lb claimer Connor Brace the biggest ride of his career, and he was repaid in style. 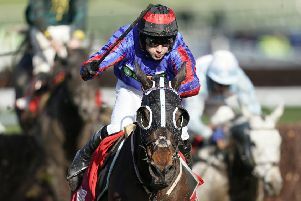 Brace belied his inexperience, riding a cool waiting race before unleashing the 4-1 favourite at the last, and she sprinted clear of Dino Velvet. “That tells you how quick the ground is – she’s lethal on this ground,” said Henderson. “We took her to Aintree but pulled her out when it rained, and then we nearly ran her in the Further Flight at Nottingham on the Flat because we wanted to win Barry Hills’ race – but we thought it might get fast up here. “She’s only rated 90 (on the Flat), so won’t get in the Melbourne Cup. She’s been on the go nine months, and I’d say she needs a break. Dan Skelton dominated the early exchanges on day two of Scotland’s biggest jumps meeting, with two valuable wins thanks to Azzuri and Molly The Dolly. Azzuri, a late absentee at Aintree last week, made every yard of the running in the Scotty Brand Handicap Chase, winning by nine lengths as the 5-2 favourite. Molly The Dolly then beat Dandy Dan by three-and-three-quarter lengths in the £100,000 J & D Pierce Novices’ Champion Handicap Chase. Harry Skelton was on both for his brother, who moved within eight of the magical 200-winner mark. Secret Investor (2-1 favourite) provided Paul Nicholls with his seventh win in the Jordan Electrics Ltd Future Champion Novices’ Chase.